I am SO excited for spring that I’m counting down the days. I absolutely love decorating for the holidays, but what I love this time of year is tidying, organizing, and even doing a little bit of redecorating. Tidying up and reducing the number of things sitting around that we don’t need anymore just feels so good. Living in sunny Orange County means that our spring cleaning starts now! I can’t wait to show you some of my Tidy Tips for reducing and redecorating all while organizing. Let’s get started in the laundry room! As most families do, we have A LOT of laundry each week. Plus, we recently got a new puppy, so we’ve added to the amount of laundry we normally do (she’s so worth it though!). I had collected a lot of random products in the laundry room that I no longer need. 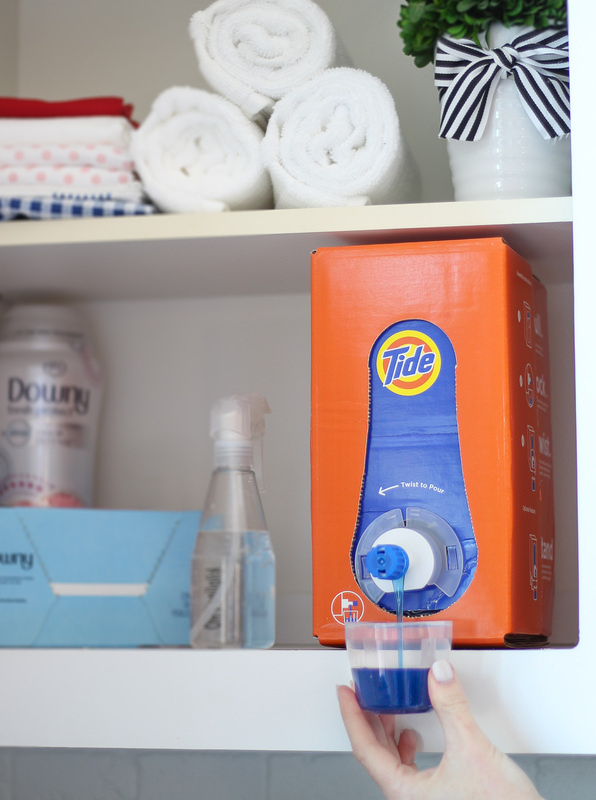 I reduced the clutter and found this Tide Eco-Box to replace our usual press tap detergent. It’s no joke when I say that I do almost all of my shopping online. All of it! Walmart.com is such a great place to get all of our household items by simply ordering online – from Tide laundry detergent to paper goods and more. 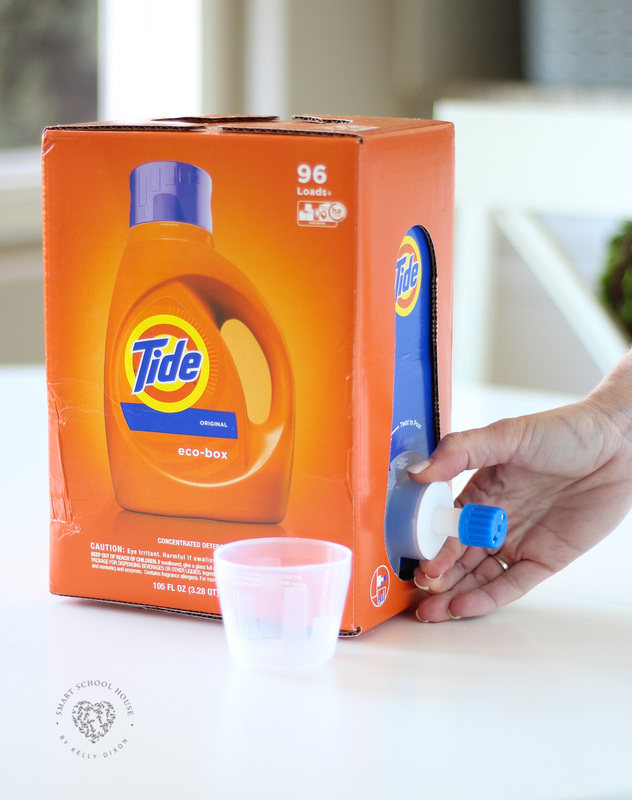 What I love about Tide Eco-Box is that it is designed to reduce the environmental impact of shipping laundry detergent. What does that mean for us? Less packaging from online shipments to put in the trash (this new design doesn’t require any wasteful secondary re-boxing or bubble wrap). Plus, the Eco-Box is about 4 lbs. lighter than the current 150 oz press-tap bottle. This box has 60% less plastic as well as 30% less water than the current Tide press-tap we’ve been using for years. Less plastic, less shipping waste, less water, less room taken up in our laundry cupboards. How does Tide Eco-Box work? Remove the cardboard pull tab on the side of the box. Inside the box will reveal a no-drip twist tap. The no-drip twist tap is similar to the press-tap we are all used to, but you’ll twist the cap instead of pressing it. 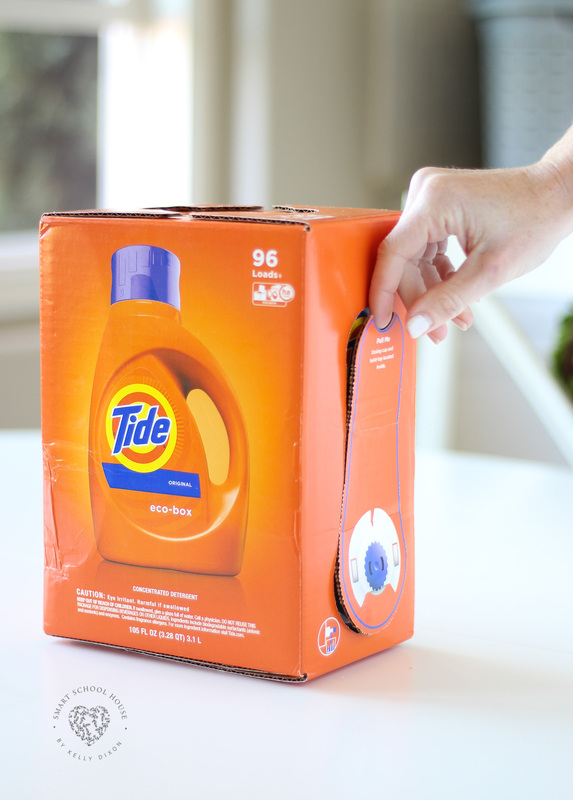 Check out this cool video from Tide to see a full unboxing of Tide Eco-Box and how easy it is to set up! A dosing cap comes in inside each box and the box fits perfectly on our cupboard shelf taking up less space than plastic container we previously used. Look at how tidy the shelf is now! 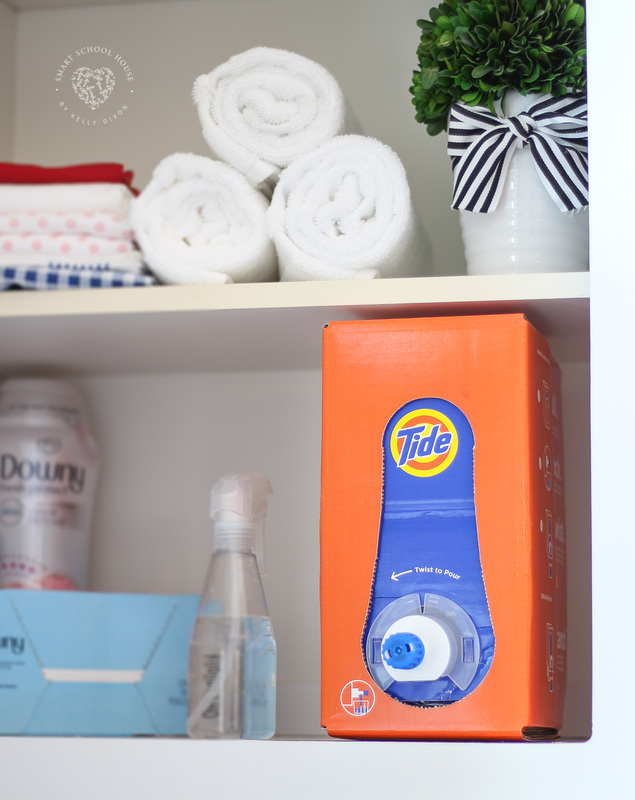 Tide Eco-Box is available exclusively online in Tide Original scent – check it out on Walmart.com. No shelf to store the twist and pour box? No problem! A convenient stand comes out from the bottom of the box to raise it up and make dosing on flat surfaces simple and easier than the plastic press-tap container. Ordering the Tide Eco-Box online makes so much more sense for us now. My makeup brushes were starting to take over the drawers. Small ones were getting lost, brushes were put back in the wrong places, the drawers were getting dirty, it had just become a mess. 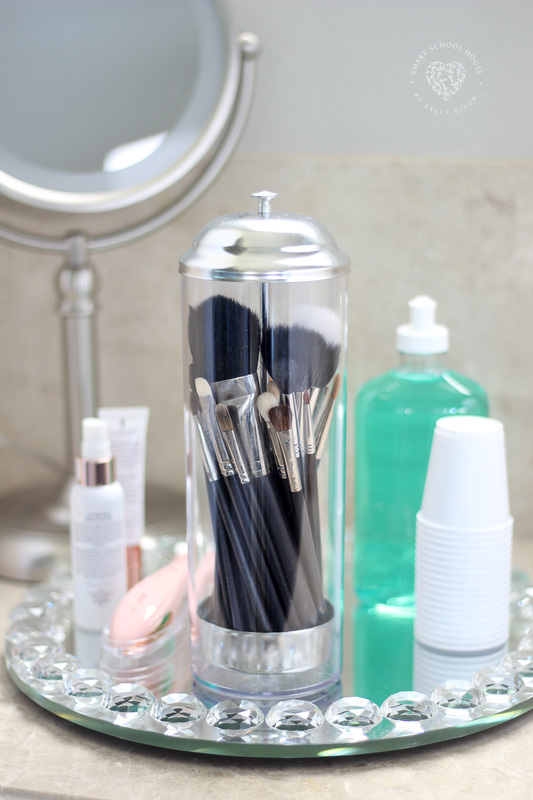 Since we recently reduced the amount of plastic straws we use at home, I decided to use our straw dispenser for my makeup brushes! How brilliant is this? I can see every brush, the brushes have 1 distinct “home” now, and they are so organized. Need a makeup brush? 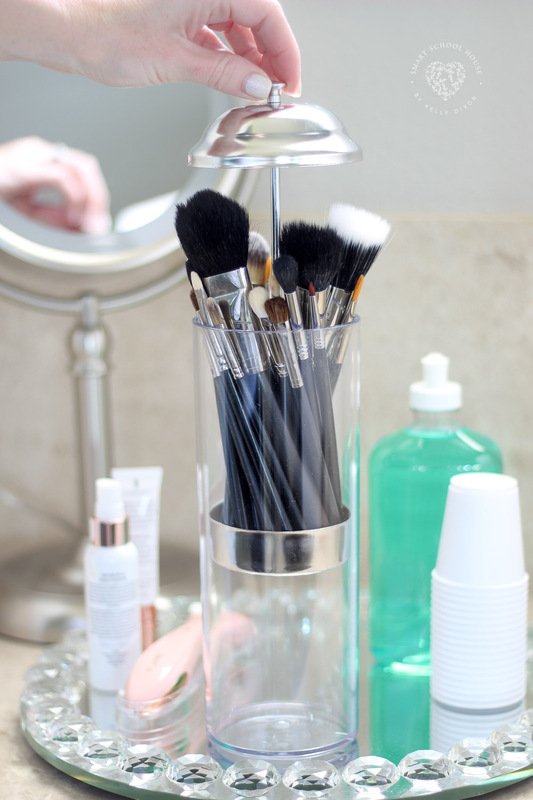 Pull up on the lid and the brushes will beautifully display themselves (just like it works with straws) making it simpler than ever before to use and store makeup brushes. I’ve owned about 6,000 bobby pins in my life. Four. I have four left. Every girl knows that is all too true! Trying to prevent an 8 year old from losing bobby pins is even harder! So, I helped her tidy up her bathroom drawers by putting peel and press magnetic strips on the inside of her medicine cabinet. 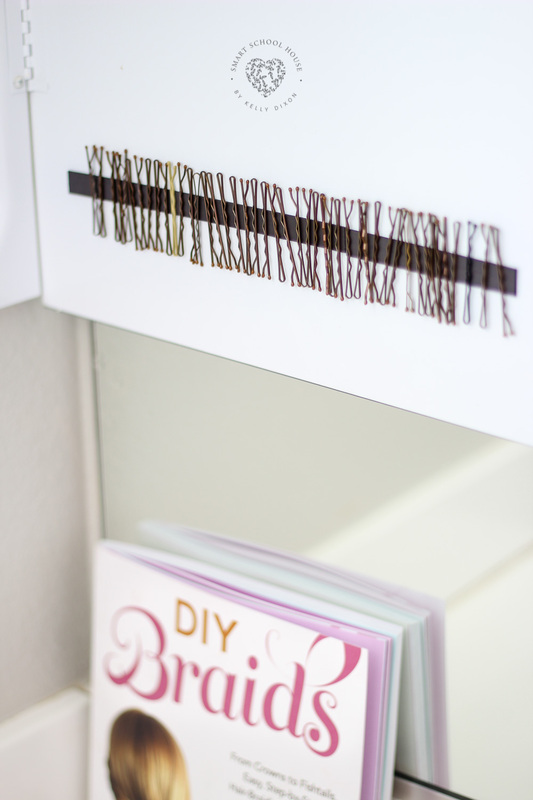 Since bobby pins are metal, they will stick to the magnets hidden inside the medicine cabinet! The bobby pins also have a “home” now… and they are no longer lost in the back corners of 4 various bathroom drawers. YAY! These were getting quite embarrassing. Before moving to our new home, we had moved a lot (like 5 times in 5 years). Despite doing my best to organize my paint, glitter, glue, and ribbon, everything had become a mess. Plus, it had become a mess in our garage! In most of our former homes, I had to store my craft supplies in the garage. In our new home, I have a great size office (it’s actually a casita separated from our main living areas). Anyways, it’s taken me months to realize that I don’t need to keep my disheveled craft supplies all over the place in the garage! I have some beautiful cabinets in my office to clean up the crafts, making them easy to access and easy to see what I have. Sadly, I started to buy multiples because I was unaware of what I had in the messy way I had things stored before. My ribbon collection had gotten out of control! For this, I used plastic bins with small wooden dowels. It’s ribbon perfection I tell you! Full disclosure: not shown are the 4 full baskets of ribbon I actually have organized like this LOLolol! But, don’t you worry, they are all neat and tidy in my office storage area now. 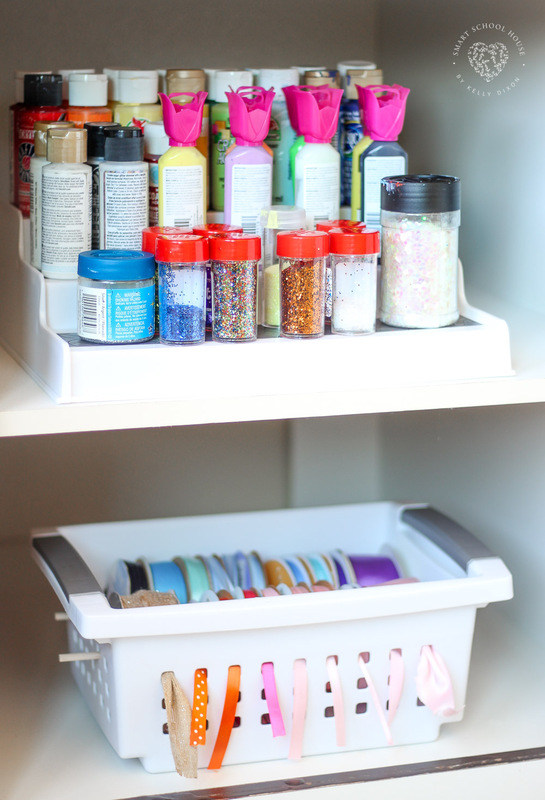 I found that a simple spice rack is thee perfect size for organizing my paint and glitter. Tiered shelves mean I can see what I have… which means I’ll stop accidentally buying multiples… How’s that for a tidy tip? Last up: a little kitchen tidying! 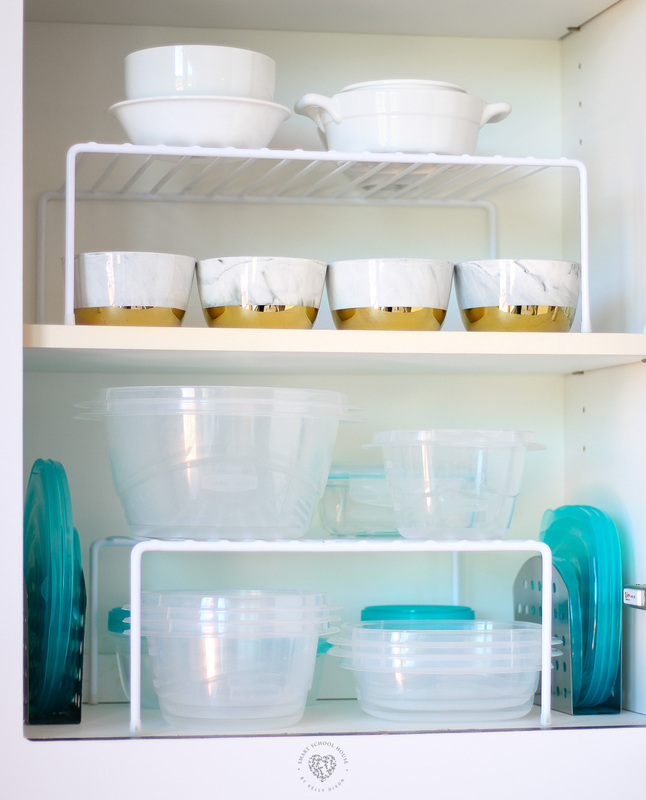 No home is complete without an inevitable mess of food storage containers and mismatched lids. This cupboard had become a complete mess (which is hard to do so quickly considering we haven’t lived here that long). I’m not sure if our dishwasher eats the lids, like how our dryer eats socks, or if we just lose track of our leftover containers and their matching parts? I’ll never know! BUT, I found a great way to keep the food storage containers and their lids organized. It turns out napkin holders (or napkin stands) hold lids perfectly! I purchased 2, one for each side of the cupboard. I also added some racks so that I could neatly stack the food storage containers neatly… as opposed to risking it all by stacking them in wobbly rows of mismatched sizes that eventually fall out onto the lucky person who happens to open the door on the wrong day. It’s so fun trying out and creating tidy tips around our home. We’ve been decorating so much that it has been easy to accidentally let the other things go. I have been ordering countless amounts of decor online, which means the reduced waste in the packing of the Tide Eco-box has been so helpful in my quest to declutter and organize. Wow! So many great ideas! 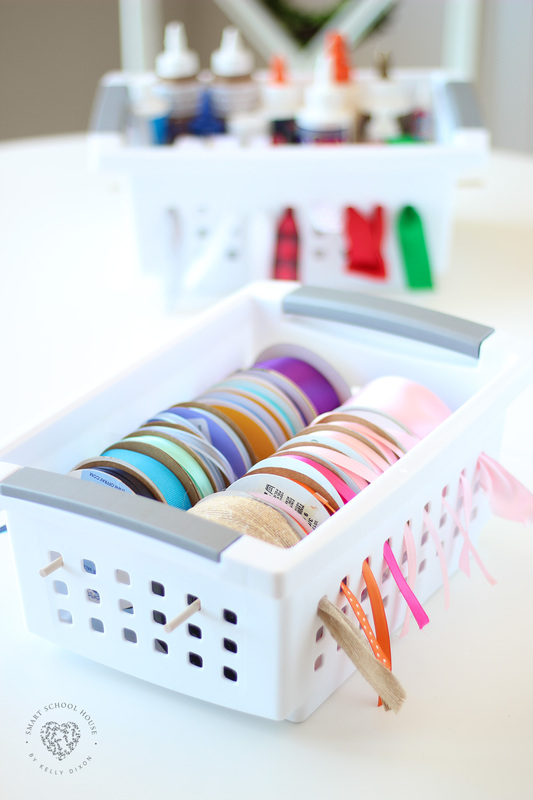 I especially love the ribbon organizer as I have mine in tubs and have to dig around to find the right one! Ugh! Thanks for helping me get organized!